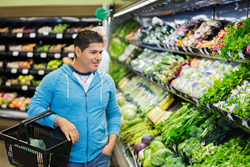 Latinos with Type 2 diabetes who live in medically underserved areas benefit from a high-fiber, low-fat diet derived mostly from plant-based sources when paired with lifestyle support. There is an increasing body of evidence linking the benefits of a high-fiber, low-fat diet – primarily from plant-based sources – to the prevention and management of diabetes. A study conducted by researchers at Loma Linda University in California found that Latinos with Type 2 diabetes who live in medically underserved areas benefit from a high-fiber, low-fat diet derived mostly from plant-based sources when paired with lifestyle support. The study, published in the American Journal of Health Promotion, showed a statistically significant reduction in mean hemoglobin A1c levels (baseline = 8.53; six months post-study = 7.31) for those who attended a five-week educational course and received ongoing support for six months versus those who did not receive the support. The study, "Impact of a Plant-Based Diet and Support on Mitigating Type 2 Diabetes Mellitus in Latinos Living in Medically Underserved Areas,” included 32 Latinos living in San Bernardino County with Type 2 diabetes whose A1c levels were above 6.4%. This area of California is characterized by a higher percentage of unemployed residents and those living in poverty than the state average and is also ranked second to last in the state for diabetes-related mortalities. Researchers used a novel approach by pairing the Diabetes Self-Management Education Program (DSMEP) with focus group intervention for 32 people randomly assigned to the control (n=15) and experimental (n=17) groups. Throughout the study, participants attended a series of five 150-minute sessions held weekly for five weeks taught entirely in Spanish at community clinics and a church in San Bernardino County. Each session included education on diabetes pathophysiology, complications, treatments and the important ways that consumption of a mostly plant-based diet and exercise can help manage the condition. With the assistance of a Latino nutritional instructor, participants engaged in the preparation and sampling of low-fat, high-fiber, plant-based foods during the second hour of each session of the DSMEP. Following successful completion of the classes, researchers then conducted a series of follow-up support focus groups at 1, 3, and 6 months after the DSMEP for those assigned to the experimental group. The purpose of these focus groups was to determine whether facilitated follow-up support as an intervention strategy improved experimental participant outcomes. As a result of the intervention, there was a significant effect of diet on A1C levels such that the mean levels improved from baseline to postintervention for both the experimental and control groups. However, the change was much greater for those who received the follow-up support. The experimental group demonstrated a statistically significant reduction in mean A1C levels when compared to the control group (P = .002). Both the experimental and control groups perceived an increase in quality of life following the intervention. “There is an increasing body of evidence linking the benefits of a high-fiber, low-fat diet – primarily from plant-based sources – to the prevention and management of diabetes. What this study adds is the importance of pulling your entire network into the mix when it comes to making key lifestyle changes so they understand your needs and can be supportive in helping manage the condition,” said Champlin.